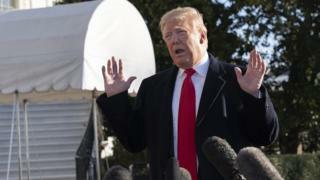 US President Donald Trump is set to argue that an immigration “crisis” requires his long-promised wall along the Mexican border. Mr Trump will make his case in his first speech from the Oval Office at 21:00EST (0200 GMT Wednesday), ahead of a trip to the border on Thursday. A partial government shutdown has been in effect for 17 days after lawmakers failed to break a budget impasse. The president is insisting that $5bn (£4bn) be included for the border wall. White House press secretary Sarah Huckabee Sanders said in a tweet that Mr Trump would use his visit to the border on Thursday to “meet with those on the front lines of the national security and humanitarian crisis”. Ahead of the speech on Friday, Vice-president Mike Pence said Mr Trump’s “passion” to address the American people “comes from this president’s deep desire to do his job to protect the American people”. The decision by the major US TV networks to set aside at least eight minutes of airtime for the speech has sparked controversy and fuelled debate on social media. Critics pointed out that the networks aired President George W. Bush’s prime-time address on immigration in 2006, but did not air one by President Barack Obama in 2014. Democratic leaders in the House and Senate released a joint statement saying the speech would be misleading and demanding airtime to counter Mr Trump’s arguments. “Now that the television networks have decided to air the President’s address, which if his past statements are any indication will be full of malice and misinformation, Democrats must immediately be given equal airtime,” their statement read. On Friday, Democratic House Speaker Nancy Pelosi and Senate Minority Leader Chuck Schumer announced that they will deliver a joint rebuttal from the the halls of Congress after Mr Trump speaks. Some reporters have called on the White House to provide the text of his remarks in advance to be fact-checked. Critics point to a Fox News interview with Sarah Sanders on Sunday, in which she was challenged by the presenter on her claim that “4,000 known or suspected terrorists” have passed through the southern border. The partial government shutdown, which began on 22 December, has affected 25% of the government. Some 800,000 federal employees have been temporarily laid off – or forced to work without pay. 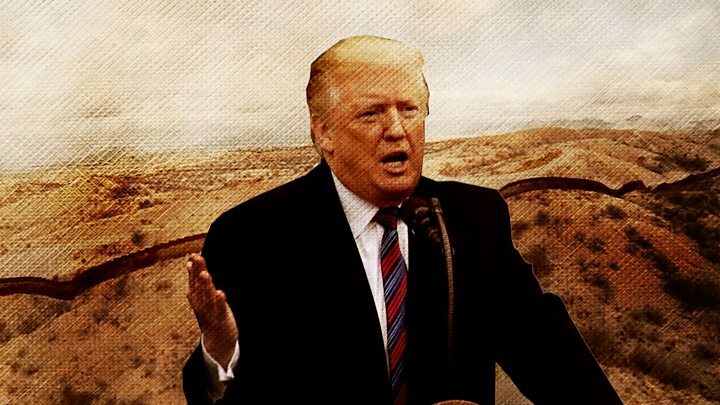 While its repercussions ripple across the country, Mr Trump has also threatened to bypass Congress and invoke emergency powers to build the wall along half the 2,000-mile (3,100km) border. US law allows the president to direct military construction projects during war or national emergency, but that money would have to come from defence department funds allocated by Congress for other purposes, according to the BBC’s Anthony Zurcher. That move may prompt members of Congress who are tasked with allocating tax money – including some Republicans – to push back, he says. Curbing illegal immigration was one of the main campaign promises Mr Trump made when he ran for president in 2016. During the campaign for the mid-term elections in November 2018, he repeatedly warned of a “caravan” of Central American migrants making its way towards the US-Mexico border. In a reaction that many saw as a political ploy during a campaign season, he deployed 5,800 US troops to the border due to what he described as an “invasion”. Last month, Mr Trump suggested that the US military could be used to build the wall. What’s the latest on the shutdown? The shutdown has now lasted almost three weeks, and appears likely to continue into the weekend when it will become the longest government shutdown in US history. The funding lapse, which began on 22 December, has affected 25% of the government and seen some 800,000 federal employees furloughed – temporarily laid off – or forced to work without pay. Nine departments have been affected, including Homeland Security, Justice, Housing, Agriculture, Commerce, Interior, and the Treasury. On Monday majority of the living US presidents disputed Mr Trump’s claim that some of them have privately told him they regret not building a border wall during their administrations. “I have not discussed the border wall with President Trump, and do not support him on the issue,” former President Jimmy Carter said in a statement issued by the Carter Center on Monday. A spokesman for George W Bush said that he never discussed the border wall with Mr Trump. A representative for Bill Clinton denied it and said that the two men have not spoken since Mr Trump took office, according to CBS. Barack Obama has not explicitly denied Mr Trump’s claim, but has extensively campaigned against the president on the issue.